Acacia pycnantha, Golden Wattle, is Australia’s floral emblem. 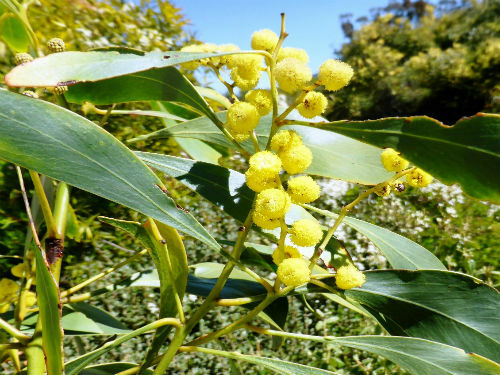 Golden Wattle develops into a tall shrub reaching a height of eight metres. The phyllodes are up to 20 centimetres long, broadest in the middle and tapering at both ends. Each phyllode has a prominent gland near the base of the phyllode. They are visible on the two lower phyllodes in the photo. Golden yellow flowers are held in large clusters that may hold up to 60 individual flowers. They cover plants in spring. Pods are long and narrow. After the flowers fade they should be cut off to promote fresh growth and maximum flowering. A. pycnantha occurs over much of Victoria and extends into South Australia and NSW. The bark has been used for tanning leather and the foliage for dyeing. Early settlers used a bark extract to treat diarrhoea and dysentery. The type was collected near Wedderburn, west of Bendigo, Victoria and named in 1842. The species name refers to the dense flower heads.